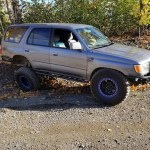 Topic: 1999 4Runner SAS and Buildup - Project "BMF TOY"
Re: 1999 4Runner SAS and Buildup - Project "BMF TOY"
Well after lots of back and forth with the wheel guy we came to an agreement. I'm keeping them and he's refunding some money. I like the wheels but I wish he would of been a little more honest about them from the beginning. If I could do it over again I would not of gotten them but that's water under the bridge now. I needed to get some motivation so I mounted one of the wheels. This is with the frame right around 24". The truck still has a 2" body lift also. It will be coming out later. I got some parts today. Anyone need gears installed in a 9.5 LC E-locked Diff. These are the washers needed to set BL and CBPL correctly. There are 23 and they are kind of pricey. I also got my front housing in. Still trying to figure out how to do the right spring perch. I didn't think that far ahead of I would have moved the third over a couple inches. I got in trouble with the GA tag people. They sent me a letter saying my tag could not be printed because it had an offensive meaning on it. I've been working on the rear suspension and I think I got it all dialed in. Tell me what you guys think about the tire placement. The body will be coming down 2" (body lift coming off) and these are pictures of the tire fully stuffed. Here's a picture of the stance. This is with 4.5" BS wheels. I may run 1" spacers on the rear axle to better match the front 66.5" width. My plan for the shackles it to go thought the frame. I had to cut the body mount a little. I'll brace it after everything is done. Here's the front spring hanger. Thanks. The more I look at it and think about it I'm thinking the same (move it back 1" or so). This is an awesome build, I can't wait to see the finished product. I want to watch reminds me of my old runner! Cool build! looks like a awesome build so far. i just picked up a 2000 4runner. i have bin looking in to do something like this. cant wait to see the finished product. awesome runner GB, im liking where this is going. Nice build, I like your tag idea I think I am going to see if UT will let it slide if you dont mind? 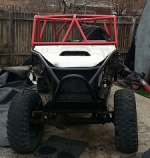 1984 4runner buggy 22r on pane, duals, hydro assist, spool front, spool rear, 37x13x16 Creepy Crawlers. I've got an Ultimate Crawl box in my garage I am thinking of putting in my '99. What solution did you come up with to avoid the exhaust changing it over from drivers side drop to passenger side drop? I subscribed to your thread. Very cool work. My '99 is also green and I even have the same drop light. i know this is an old thread but any news on what happened to this? I am planning a similar build and would love to see if this ever was finished. Nice work. Looking forward to seeing the finished product! Love the axle, any updates? Like how this is coming along.. Thanks for all the positive comments guys. I still have the truck and it's mostly just a roller as of right now. I purchased some land and have been building a 40x60 shop and house the last few years. I do plan on completing this build. I just sold my DC Tundra to put $$$ into my 89 4runner and also into this 99 build. Looked like a sweet build. Any updates? Looking really great. I would move the rear axle back as far as you can and remove rear bumper so you as much wheel travel as possible with out getting into the body. After all extending the driveline cost the same. Project "RAWHIDE" a High School buildup !! !shackles installed no pics.....yet! !